This repoprt analyzes merger and acquisition (M&A) activity in the pharmaceutical contract manufacturing industry during the period 2015–2017 and assesses the implications for acquirers and sellers of such services. The services considered in this report are contract manufacturing of active pharmaceutical ingredients (APIs) and finished dose products, associated analytical services, and packaging. Contract research providers were excluded. There were 130 acquisitions of service providers during the three-year period from 2015–2017. 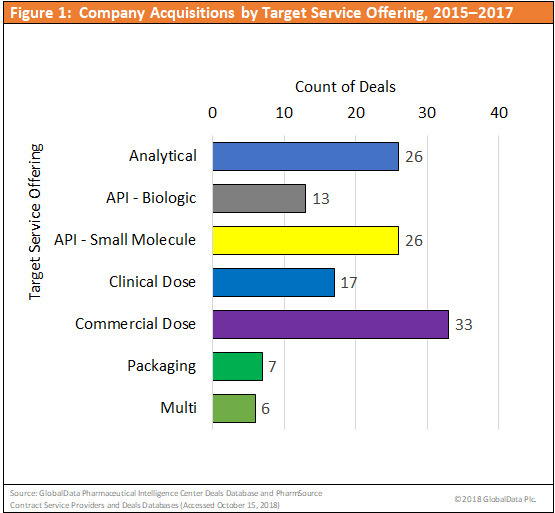 The majority of acquisitions targeted contract manufacturing organizations (CMOs) that focused on APIs—small molecule, dose, and analytical services.